During the holidays, San Diego really lights up. 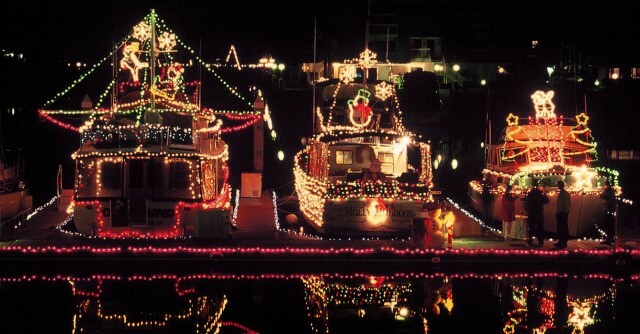 An annual holiday tradition, the San Diego Bay Parade of Lights has over 80 boats and yachts festively decorated with twinkling Christmas lights for spectators on the shore to enjoy. Held during the first two Sundays in December, this is one holiday tradition you won’t want to miss. The parade begins right here on Shelter Island. You can step just across the street from your guest room and view all of the festivities as they begin! If you really want to make the most of your night, stop in to Humphreys Backstage LIVE before the event, and warm up with delicious cocktail. Here are the best places to view the parade on Sunday, December 9 and Sunday, December 16. Special tip: If you want to venture off of the island, you can see the parade from land on the Embarcadero, or along Coronado—both options tend to be less crowded and offer excellent vantage points.